Today's post is being kept short and sweet (but still in the typical Karen style so not too short!) 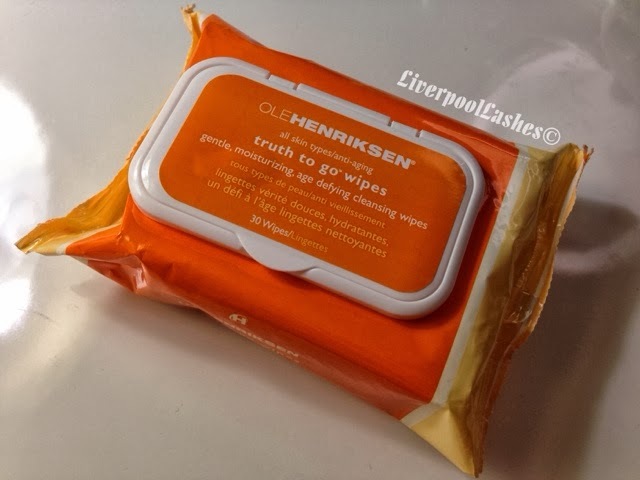 I added the Ole Henriksen Truth To Go Wipes to my US shopping list as a few of the UK You Tubers (mainly Fleur De Force) raved about them. I remember Fleur specifically saying they were 'an expensive purchase they have a gorgeous orange scent' and that convinced me to try them for myself as a luxury treat. She also mentioned that you can get them in the UK but they work out cheaper buying them from the States so that's what I did. Let's make this part quick... the scent? Yes the close fruit is oranges... but that really chemically orange scent. It reminds me of those vitamin C tablets that you get and drop them into water for you to drink to boost your immune system, its the fragrance equivalent of how those things taste. It's not an authentic orange fragrance at all which totally shocked me for the price. I wouldn't say they were as wet as lots of other brands, if you're thinking you could take your make up off with them you're going to struggle with your eye make up. The bottom line is... I don't like them. I wouldn't recommend them. I don't even think the scent is anywhere shape or form pleasant. It doesn't allure me into repurchasing them and they're borderline useless. If you really want to try them then the good news is you can buy a smaller 10 pack for £6 here but don't say I didn't warn you!